Will Outsourced IT Leave My Internal IT Staff Jobless? Outsourced IT, like any outsourced services, can cause concern for employees and management. Often times, employees view outsourced IT as a first step to their organization eliminating their internal IT department. Employees don’t want to lose their jobs and management doesn’t want to lose valuable talent. Truthfully, outsourced IT services don't replace an internal IT department; it makes them better. The more hands you have on deck, the quicker daily tasks can be done and the more time you’ll have to focus on larger IT initiatives. So the answer to your question, “Will outsourcing our IT needs replace my talent?” is no. Whether your internal IT department takes up a whole floor in your office building or it’s a department of one, outsourced IT can help you increase efficiency while saving time and money. Outsourced IT service supplements your business's internal IT department. These outsourced services you agree upon with your provider generally won’t include all the functions of your internal IT staff, simply because it is too cumbersome and illogical for an external source. So, the primary function of outsourced IT services is to be another pair of hands when the work load gets too heavy for your staff to manage. Another benefit is having access to special skill sets and expertise you may not have in-house. Some IT tasks are easier for an internal IT department to send to your IT provider. 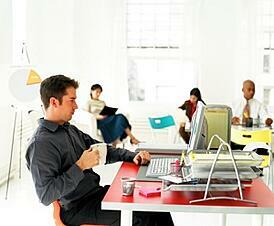 Outsourced IT resources are there for your internal staff to rely on. This daily support allows your internal IT department to focus on other IT initiatives, thus achieving better business results. The processes your internal IT department uses to function may benefit from some efficiency improvements recommended by your outsourced IT provider. Suggestions for change might be what your business needs to increase functionality while decreasing costs. An IT department can easily become stressed and stretched to their limits managing the everyday tasks. Outsourcing IT services can also provide organizations with proactive services like maintenance and monitoring, thus preventing any issues before they become nuisances. You’ll receive monthly status reports from your Outsourced IT provider. These reports will detail network and device issues and productivity; they’ll give you a good understanding of how outsourced IT is benefiting your business and where improvements can be made. Cloud computing is offered by many IT service providers. Cloud computing helps businesses supply the resources it needs to process and store documents and other files in the cloud. Whether your business needs more storage one month or higher processing ability the next, cloud computing services offered from IT providers can achieve these needs immediately. An outsourced IT provider offers your business training and educational technology seminars for your IT department so they can train new employees as they join your business. An IT provider focuses on training a few in-house staff members that can serve as the on-site IT resource for all of your employees. This allows your employees to get the required training when they need it. Your in-house IT staff often knows the technology needs of your company best. Your outsourced IT team will work with your in-house IT staff to better understand your business needs. They will then offer technology recommendations that allow internal staff to make the right technology selections for your company. Your internal IT department will become stronger with the support of outsourced IT services.